Whisk together the flour, salt, and sugar. Be sure to break up any clumps. Using a fork or pastry blender, mix in the butter until the particles are very fine. Though the mixture looks dry and powdery, it will firm up as you pack it in the pan and it bakes. Use the bottom of a glass to evenly press the mixture into a smooth and compact layer in a 9 x 13 x 2 inch pan. Bake the crust for 12 minutes, until it is lightly browned. Remove from oven and set aside while you prepare the topping. Leave the oven on. Set a double boiler with a medium-sized bowl over medium heat. Combine the corn syrup, butterscotch chips, salt, butter, and water in the bowl over the hot water. Stir constantly while the mixture melts. 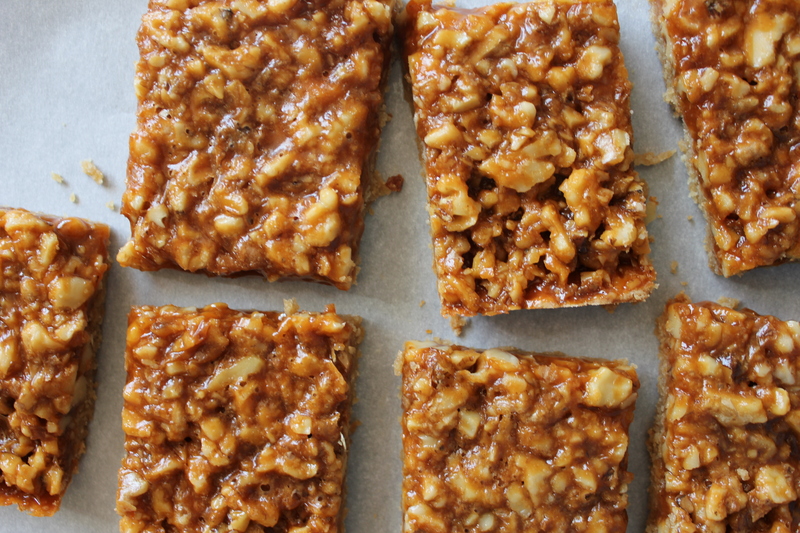 Once melted, immediately stir in the walnuts, stir until they are fully covered in the butterscotch mixture. 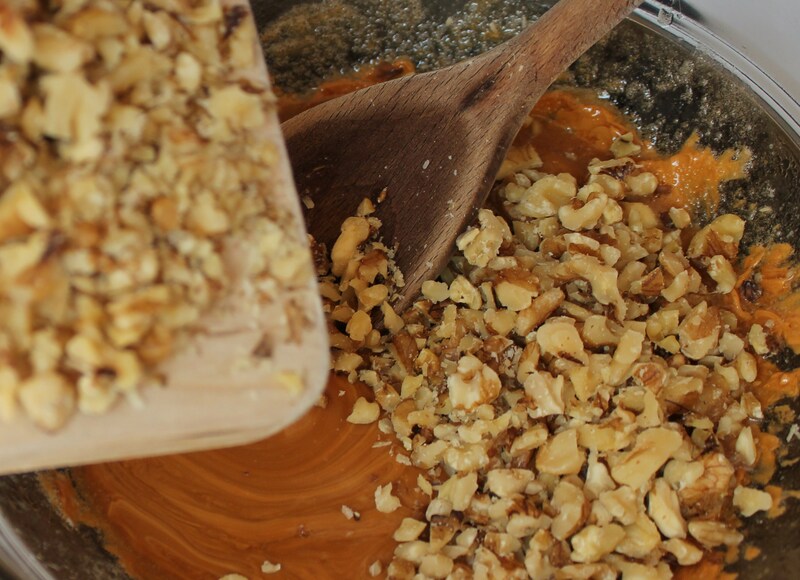 Using a rubber spatula, scoop the walnut mixture onto the still warm crust. Spread evenly over the crust leaving a 1/2 inch border around the edges. The mixture will spread as it bakes. Slide the pan into the oven and bake for 10 minutes. Allow the pan to cool on a wire rack for 30-40 minutes. Using a sharp knife or a rolling pizza cutter, cut around the edges to release and then slice into bars. Use a spatula to lift the bars from the pan. If they still seem too soft, let them cool further. They will become very crisp and easy lift. I can personally vouch for these — having been on the receiving end. They didn’t last at all because I ate them. Delicious! 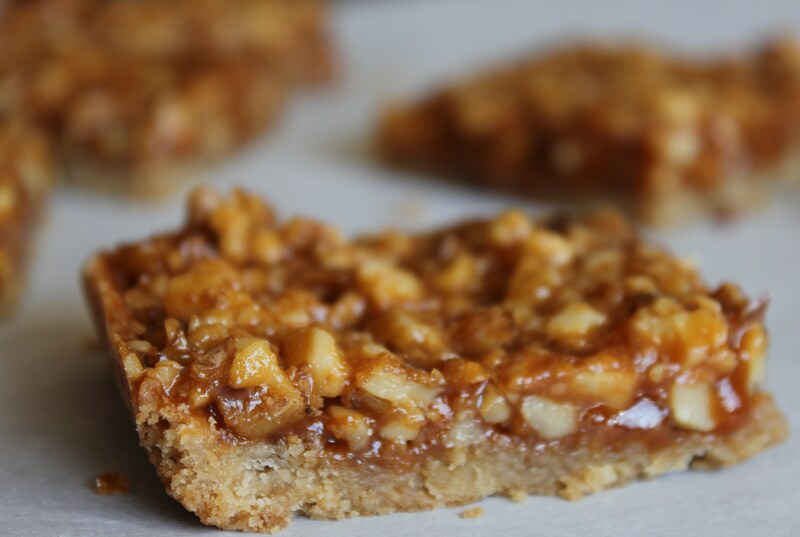 Divine – I love butterscotch and walnuts! And I would not have any self-control around these at all.